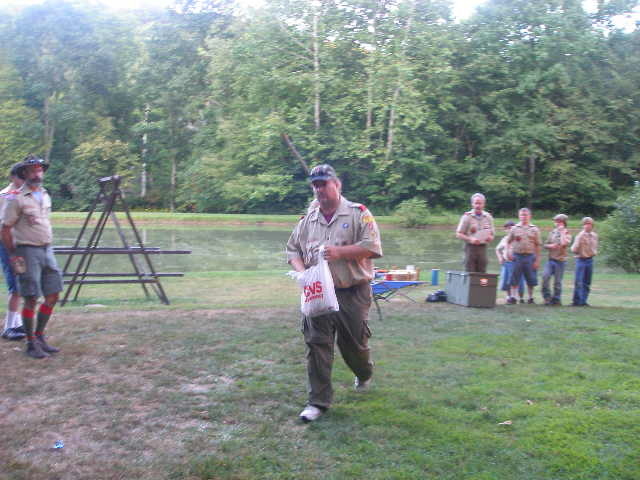 Our old Flags will be retired under the direction of Scoutmaster Douglas Mugglin. The ceremony will begin at 2000 on Saturday. 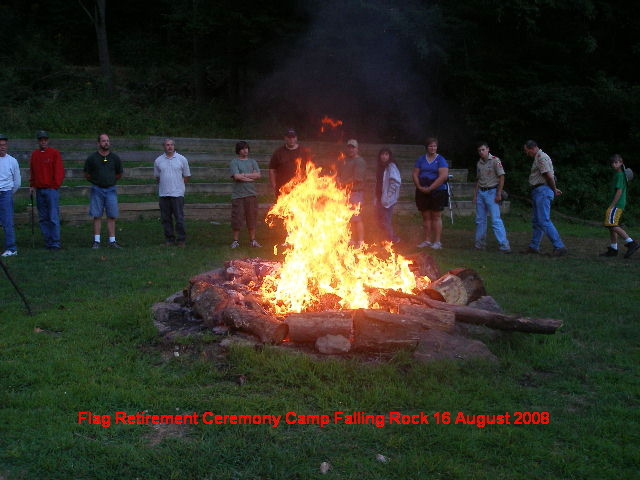 Flag remains will be buried Sunday Morning. 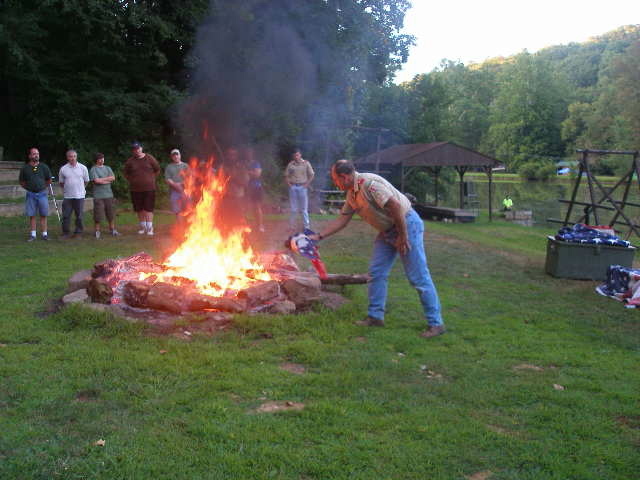 This is one of the ways we Retire our Flag. Note: we added to this script Iraq and Afghanistan. First Speaker: "I am your Flag. I was born on June 14, 1777. I am more than just a piece of cloth shaped into a colorful design; I am the silent sentinel of freedom for the greatest sovereign nation on earth. I am the inspiration for which America patriots gave their lives and fortunes; I am the emblem of America. I have led your sons into battle from Valley Forge to Vietnam. I have been there though the Civil War, Two World wars, at Gettysburg, Flanders, Korea, the Gulf War, Iraq and Afghanistan, all of them. I was there with George Washington, Abraham Lincoln, Teddy Roosevelt, John F. Kennedy, and I here with you now. I have flown through Peace and War. Through strife and Prosperity, and amidst it all, I have always been respected. My red stripes symbolize the blood spilled in defense of this glorious nation. My white stripes, the burning tears shed by Americans who lost their sons in battle. My blue field represents God’s Heaven under which I fly, and my stars, clustered together, unify the fifty states as one for God and Country. MC: "Scout Salute! To the audience: Please join me in the Pledge of Allegiance:"
**"I pledge allegiance to the flag of the United States of America, and to the Republic, for which it stands, one Nation under God, indivisible, with liberty and Justice for all." Just a simple piece of colored cloth, sewn together in a red, white, and blue design. A piece of cloth that of itself does nothing more than hang or blow in the wind. But too many thousands of people though out our nations glorious history, it has stood tall, standing as a monument of Freedom, for all Americans. Men and woman have given their lives for it, fought for it, cried for it, and revered it as a symbol for the greatest country on earth. Books, songs, and poems have been written for it, and our National Anthem, The Star Spangled Banner was inspired by it. Each day our children are encouraged to pledge their allegiance to it, and when ever it is raised or passes by, we all place our hands over our hearts or salute it. It stands for the freedom we all share and the pride and patriotism we feel for our country. "Soiled flags may be renovated by either washing or dry cleaning. 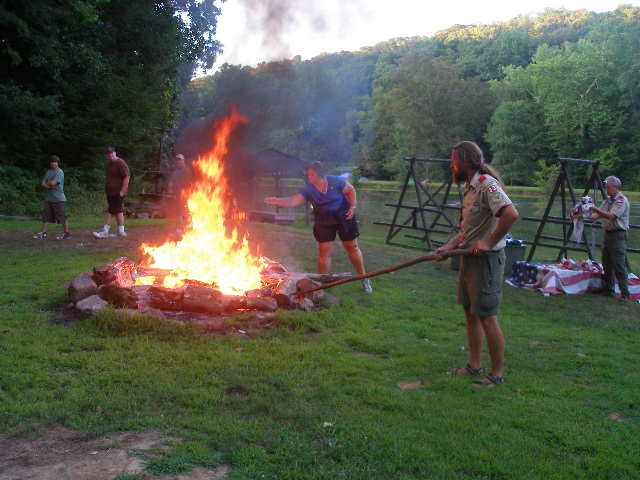 Worn out flags should be destroyed in a dignified manner, preferably by burning." The importance of this act, and the pride and emotions that it evokes make it a very powerful event that can serve as a reminder of our National Pride and help instill the values brought forth in developing good citizenship in our youth. With this in mind, the retirement of our nation’s flag then becomes a heavy responsibility that must be addressed with the proper respect and dignity it deserves.